As I mentioned in my previous post about heading off to Computex with a bag weighed down with AV kit, at work, we’re really pushing on with expanding what we, technically a bunch of magazine journalists, do. When I joined, close to four years ago, I wrote articles for a magazine. In the past year, this has been expanded to include podcasting, shooting photos for web and magazine stories, and now, shooting video! 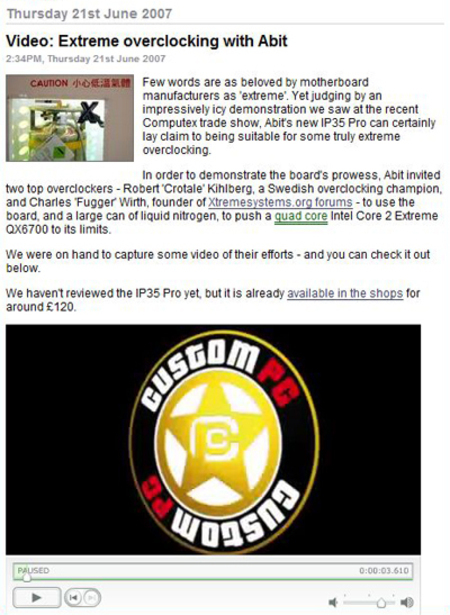 Footage from the Computex trade show of some overclocking with liquid nitrogen is very neatly embedded in this news story here. There are many decent blogs on the web that deal with the way journalism is changing: I’ve got RSS subscriptions to the fabulous Journerdism, Invisible Inkling, Publishing 2.0 and Wordblog to name just a few. It helps me keep up with what’s going on, and gives me a lot of valuable stuff to think about in terms of how my career field is changing. These sites are great and tend to avoid the position about journalism that is extremely common around the web: the assumption that pretty much anyone who writes for a print product doesn’t get the web, and doesn’t want to. Now, this is probably true for some journalists, but most of the journalists I know can’t wait to get their hands on video recorders, cameras and decent CMS systems. I think the reason the opinion that journos hate the web is so widely held is that it appears to be true on a much wider scale, because so few major print brands have good websites. It’s a quick judgement, but an easy one to simply say – bad website = people who don’t care about the web. However, it’s usually not the journalists – the writers – who make these websites. And being a blogger, when you want to change something, you just log in, and apply a different theme, or add a widget, or write a post. It’s great. I know, I love TypePad for that. Can’t do it at work so easily, though – print brands (like Custom PC) are owned by large companies, large, multi-department companies that devolve control of stuff to many different teams, and when it comes to something new like the web, the structure is not all that well defined, especially in terms of who does what. I’m with him on both sides; that it’s hard to change, but when it does change, the opportunities are massive. The truly new CPC site is coming and it will be great, I think. I hope. This entry was posted in On Journalism and Media, Tech. Bookmark the permalink.